9 Cuestion regarding one of the movie's title. 19 Just had an idea, I think, we can put to a great use. 46 Can you have someone fix the front page please? Would like to help re-build the 007 Agent Under Fire page, I have the original Xbox version of the game and can help bring some much higher resolution images and hopefully better descriptions. It may take me some time to build the page back up as I will have to replay the game all the way through in between my full time job. Hi! Thanks for responding to me! I have a few followup questions: 1) Do you play games much? If so, do you play scifi shooters as well as shooters with realistic guns? Or are you generally drawn to games with more authentic firearms? 2) How much does the increasingly weird weaponry of Call of Duty games harm your enjoyment? Is it like a minor annoyance, or does it make it much harder to get into the game? THANKS! Cuestion regarding one of the movie's title. Just had an idea, I think, we can put to a great use. Thanks for correcting. I'm not insisting on adding brackets to an actor's name on his or her actor page - as you may have noticed, I do that only for image descriptions as it's the quicker way to have name in bold on such a page and I just thought that in bold it looks nicer. As for the redirects - I haven't found anything on doing that for actor pages - do you mean re-directs in general? I've discovered how to do them rather recently and usually go for a slightly idiosyncratic way - I firstly name the page with a re-direct title and then correct it to the normal one. Is it okay? For each weapon to make annotations in this style? Or do a separate article on the end of a page in this style? Hello Funkychinaman! I'm sorry, I have some question: I know, that pages about media, that contain only tanegashima matchlock are ineligible. 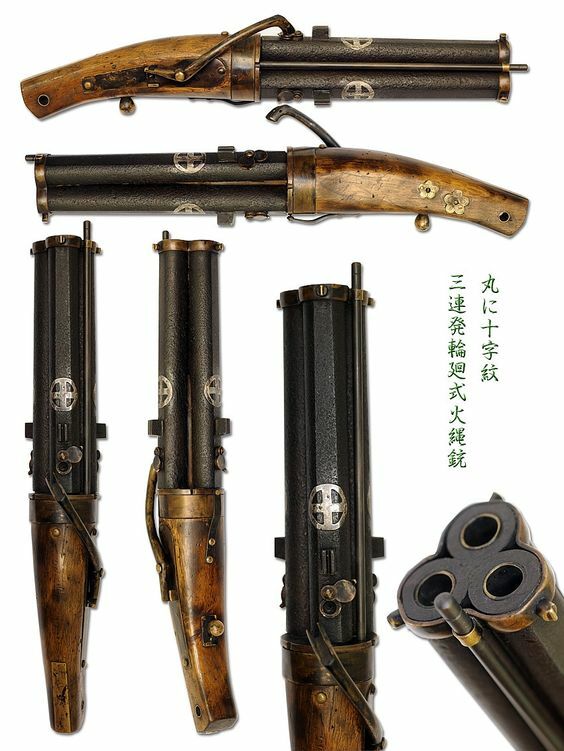 But, the movie Azumi also contain very rare, but realy historical exist Japanese matchlock revolver 1, 2, 3, like this. So, may I upload screenshots on discussion page to view it for Administrators. Well 1) PLA is in a lot of media recently (BF series, Passion leads Army,Project Reality, and a lot of movies) 2)Historical pourpose (and in case of a reunification) 3)I promise that I will end in less than a month. (If I got blank check of course) --Dannyguns (talk) 09:54, 21 January 2017 (EST) So can I make it? The joke was because I ask at Funkychinaman the honor of delete them, but if I need to line..
Hello, Funkychinaman! I'm sorry, I have some question: I know, that pages, than contain only one firearm don't qualify if this gun is seen only in holster. But, the movie The Power of Fear (Vedma) contain note one, but two different revolvers (Sheriff's Taurus Model 689 and 2nd deputy sheriff's unknown revolver). Both were never dran from holsters. So, may this page be eligebly, due it's contain not one, but two different guns? The prooved screenshots can be seen on disscussion page: disscussion page. Movie page on imdb. Hi,Funkychinaman!Look,I'd like to create a page for the romanian film Reconstitution(1960) by Virgil Calotescu.The problem is,I can't find the right genre for it.I mean,the film is about the famous 1959 National Bank robbery(in Bucharest), and it's like a documentary(it features the actual robbers in the main roles)....but it isn't really a documentary,it's more like a propaganda film.So,I don't know what to do.Please give me some advice. Greetings Sir, I apologize if this is the wrong forum, just wanted to say thank you for editing the entry I added, I am very new to this medium and can use all the help I can get. Much appreciated! Can you have someone fix the front page please? You need to remove the picture of the Llama as it is a copyrighted image from carbinesforcollectors.com I will file suit if you do not.and have your site removed. I guess that the source of the problem image is this page: Llamapage. Llama XVIII image looks the same as on their site but maybe some other images are also taken from Carbinesfrcollector. My English isn't good enough to discuss the problem. What should we do? I also made a topic on Admin forum. Ya, most of them are easily indentifiable aside from looking cartoonish. The Supressed Pistol seems to be based on a FN FNP/FNX-45 with a supressor and a Tirijicon RMR. The only weapon I seem to be struggling with seems to be the Revolver, since it looks old, but features multiple things from different old era revolvers and is double-action. The game has both modes present when you open it (althrough unless you pay only one of them is, so I'll probably treat it similar to Call of Duty and it's Zombies mode). I'll be uploading and writing most of the things through this weekend and post it all at once when it's done. "I thought the SG-43 was mocked up as the M240 because the heat sheild,the heat sheild was made crude." Hey man, noticed you asked about "hasn't this been out for a while now?" regarding the status of Squad's release. However, I'm still not awfully sure what's IMFDB stand on when a game is released. In the Escape from Tarkov page, it has the WIP banner, and I assume it's because it's currently in Closed Beta and it cannot be considered as "released" fully yet. However, for Squad, it is on Steam yes, but it is still in Open Alpha and is still far from full release. In this case, may I clarify what "released" means on this site? It is the moment it is available for purchase and play (aka Escape from Tarkov, which arguably is), or is it the moment it leaves beta and becomes a full build? Hi, I just noticed that you marked my page for Super Scribblenauts for deletion. I was just wondering your reasons for it minus the cartoony art style.